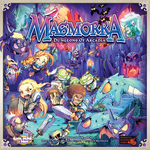 A spin off stand alone based in the Arcadia Quest universe. The action takes place down in the dungeons of Arcadia. Explore new locations and fight new monsters in this CMON dungeon crawler. All as new and never played. One miniature had it's shield broke off in transit but this has been successfully glued back on. This is the Kickstarter release of the game and so includes all stretch goals and exclusive miniatures.